The Defenders of Friendship-2016 drills underway in Alexandria. 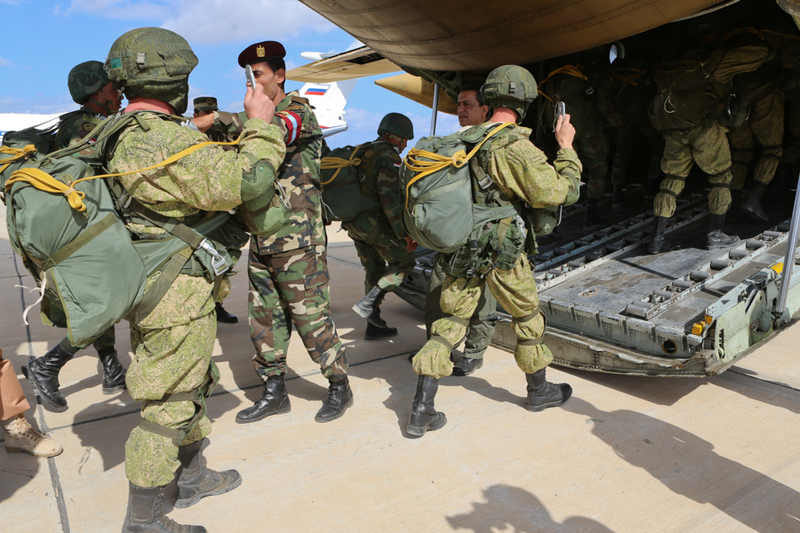 Russian and Egyptian paratroops have parachuted themselves from Ilyushin-76 and Casa planes to regain a community from hypothetical militants as part of a practice drill. "In the course of the main phase of the anti-terrorist exercise Defenders of Friendship 2016, underway in Egypt, Russian and Egyptian paratroops are conducting joint exercises to practice localization and elimination of militant groups in desert conditions," the Russian Defense Ministry said. More than 15 planes and helicopters are involved in the exercise. Ten pieces of military equipment were parachuted. Some 300 paratroops from both countries participated in the airdrop. "The personnel parachuted themselves over two sites from altitudes of 600 meters, 1,800 meters and 2,200 meters. The main airborne group used the D-10 and T-10V parachute systems and also the special-purpose Arbalet-1, Arbalet-2 and MS-5 parachute systems," the Defense Ministry said. All units involved in the drills used a common system of communication. A joint operation group ran the exercise from a command center at the El-Hammam base. The exercise near Alexandria has been underway since Oct. 15 and will end on Oct. 26.